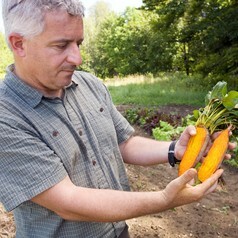 Our lab focuses on breeding and genetics of cross-pollinated vegetable crops; primarily carrot, onion, and table beet. The year 2014 marks our 65th year working with these crops, and over these years we have released numerous inbred lines, open pollinated populations, and germplasm for use by breeders throughout the world. Our lab also studies traits of importance in these crops and seeks to find new methods of breeding and genetic improvement. A theme running through our work is the examination of traits of consumer interest, such as health value, color, flavor, shape, and other quality attributes.